Options for Leather shift knob and shift boot?? I'm looking for a new shift knob for my GTZ. I'm tired of the goofy looking factory unit. I've seen a number of nice leather shifters and boots adapted to the Beretta and I'd like to do the same. I can modify my shifter arm for any thread, so it's just a matter of finding the right setup. Any ideas? Post some pics! Re: Options for Leather shift knob and shift boot?? Mine is the leather Hurst knob from 4th gen Camaros. No pattern on it, just an H. But it's a comfortable, good looking knob that's cheap. 16mm thread. For the leather shift boot I had one sewed up by an upholstery guy. But I looked into adapting one from another car too. There is a BMW boot on eBay that is pretty close. I finally got around to installing a leather boot a few weeks back. I'm really happy with it (especially over the stock joke). I went with a 4thgen Fbody leather boot. I basically used the 4 screw holes on the bottom of the shift place to attach the boot to the underside and then used a special leather/vinyl eboxy to bond the edges to the underside. Came out really nice. I put this off for way too long because I kept thinking it was going to be a more involved experiment than it actually was. 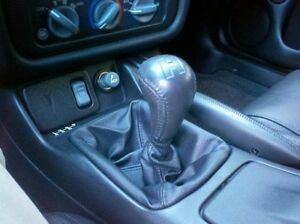 I debated between the SLP/Hurst leather shift knob (4thgen Fbody) and the MR2 shift knob. The Hurst/SLP would have screwed right onto the Grand Am threaded shifter arm that I have but I actually opted for the MR2 shift knob. It's a bit shorter than the SLP setup and I really liked the way it felt in my '93 Turbo. It should be here in a couple days and I'll have to cut/weld an M12x1.25 piece on the shift rod but it should look good. I received the new leather shift knob from http://www.super-klasse.com today. Although it is made for an MR2, it will work nicely in the Beretta once I weld an M12x1.25 bolt onto the shift arm. Quality seems very good with this shift knob. It's weighted - definitely a lot heavier than I was expected. Should help make nice, sold shifts. The pictures are bit misleading - the knob is not oversized as it looks in the photos. It is a 4thgen Fbody boot. I got the shifter arm modified. I was originally going to modify the Grand Am shifter arm that I've been using for a while (since it was already threaded) but I decided to modify the stock Beretta arm instead. The MR2 shift knob is a M12x1.25 thread unlike the Grand Am, which is M16x1.50. I went down the local Rural King and grabbed a 70mm long bolt and then cut the head off and welded it to the shortened Beretta shift arm. I added a washer to support the shift boot and keep it from sliding down. Looks awesome and feels great in the hand. I'm happy with the final result! I decided NOT to cut the combined/overall length of the shifter arm down because the stock[ish] height works pretty well because of the armrest height.